Discover what people are saying about brands, politics, fashion, media, sports… you. What Ideas Drive Online Interactions? 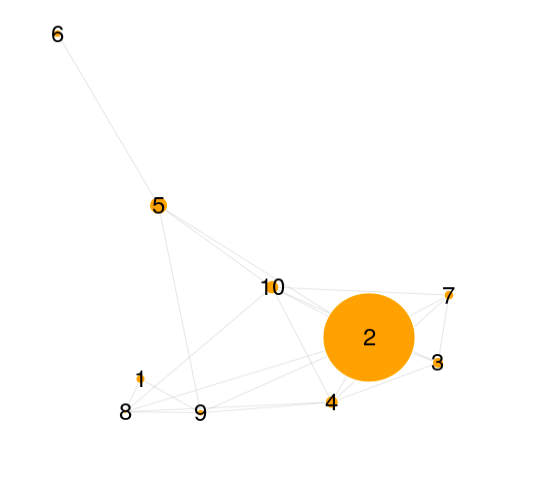 discourse data maps online social discourse to track groups of people and ideas driving the stories important to you. Beyond clicks and likes, learn how people and ideas shape your narrative. Social listening is made actionable with products to analyze, track and understand. View some of the people, ideas and issues our visitors find interesting. 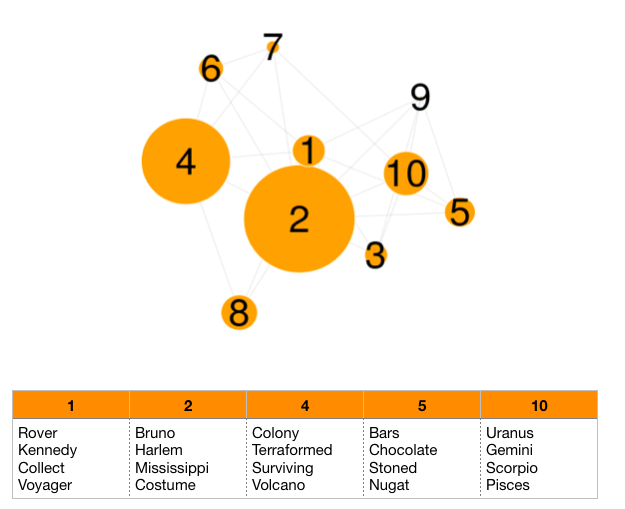 discourse data uses data analytic tools and visualizations to present a data based narrative. We analyze millions of online comments that are organized in discussions around selected topics of interest. 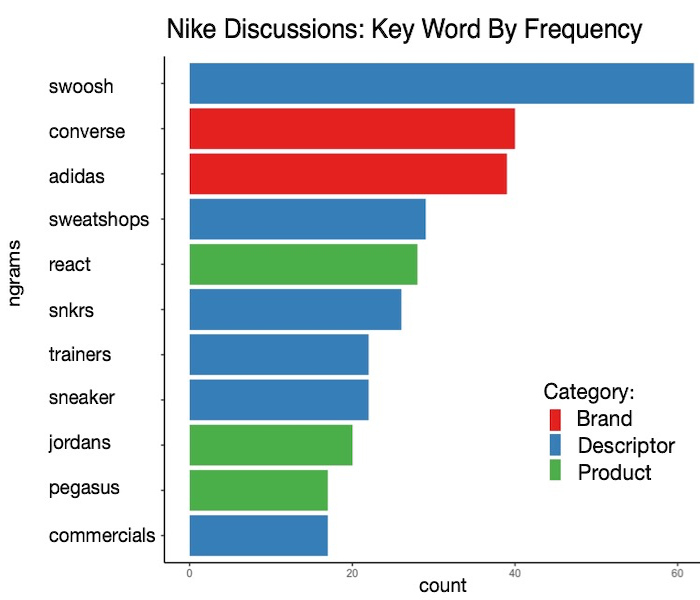 A Narrative Snapshot presents a concise overview of how people are talking about a topic. What words are used, how authors overlap with various discussions, or how groups show affinity towards related topics and so forth. Each snapshot is just the tip of the iceberg. Further digging can reveal details about sentiment, opportunities, influencers, competitors, etc. A Discourse Overview summarizes the top author and word level structure of a topical discussion. 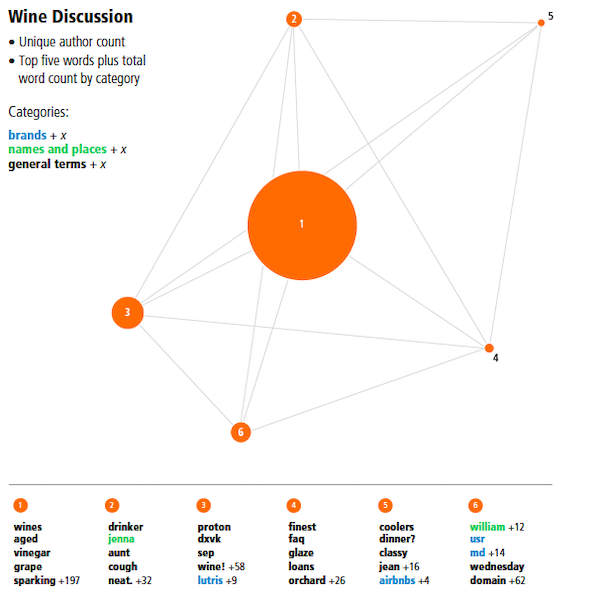 This is a network map showing the relative size of each discussion, the author overlap between discussions, and the most important words in each discussion among other details. An Affinity Plot presents commenting authors in a spatial relationship to reveal author interest overlap among topics, in this case subreddits. The spatial relationships between any three poles indicates the degree to which authors posting in topics represented by the poles also post in other in other topic categories (subreddits). Topical discussions about planets and space exploration exhibit clear aspirational versus practical dimensions. Interest in exploration includes references to future desires and aspects of colonization, habitability and affordability. Discussions involving current organizations focuses on technical aspects of space flight or a new generation of astronauts. 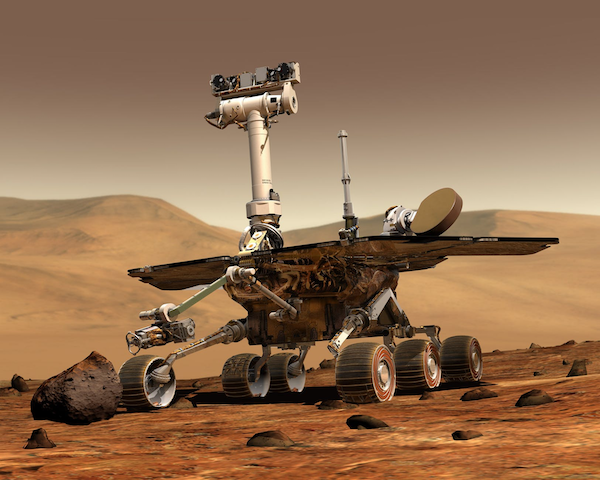 Search results for "Mars Exploration" offer a rich network of well defined discussions ranging from candy to music, science fiction, space probes and travel. Authors are well aware of current scientific activity on Mars but many are more interested in ideas colonization and habitability. 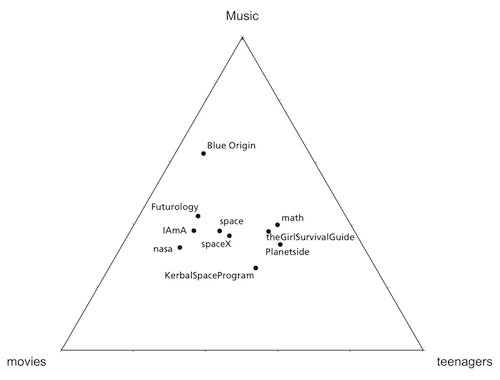 However, the largest discussions related to Mars revolves around music, although the Mars Bar is not forgotten. Affinity Maps can help visualize competative attributes or possible partnerships. 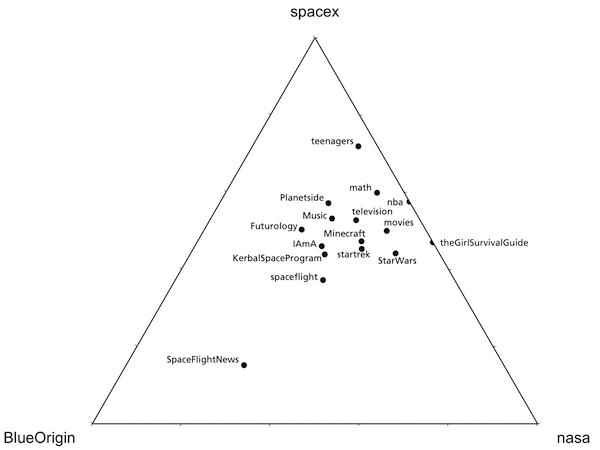 In this case, we show where three organizations (NASA, SpaceX, and Blue Origin) stack up with teens, gamers, girls and science fiction buffs. Blue Origin may want to figure out why girls show little awareness while gamers and movie buffs skew towards SpaceX and NASA. 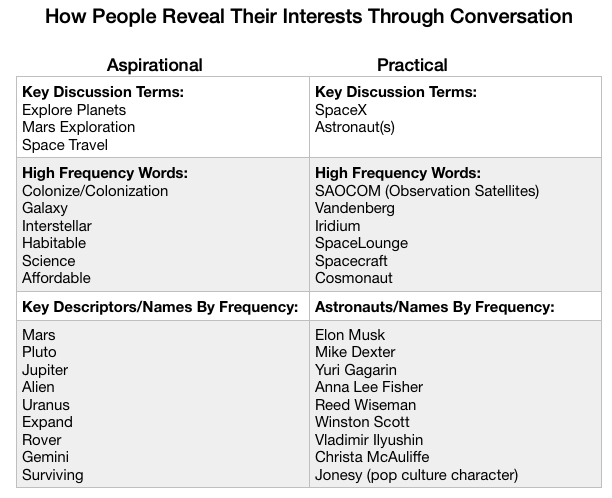 Word frequencies, sentiment and other semantic categories offer data on which to base decisions and candidates for further exploration. Note that in the list of most mentioned Astronauts, none of the baby boomer Astronauts other than Yuri Gagarin are on the minds of the relatively younger participants on Reddit. Understanding the lay of the land is important for proper brand positioning. For example, in cosmetics and makeup, discussions around “Makeup” focus on beauty, glamor and personal appearances. "Cosmetic" discussions revolve around skin care, health and beauty regimens. Authors have clear and nuanced views of where various brands fit in those discussions. Discourse maps can reveal opportunities to re-enforce these current notions and opportunities for brand engagement to reposition or change the discourse. 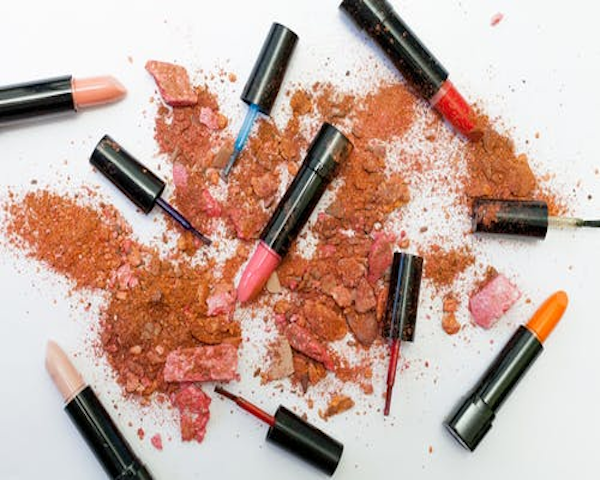 The Makeup discourse reveals a thriving set of “how-to” discussions along with references to pop stars, models and drag queens that people associate with brands or specific makeup application techniques. Many discussions include references to brushes, eyebrows, liners and brand recommendations. For brands looking to highlight their health benefits, the discussions around cosmetics offers insight into what people prefer for their nightly regimens, what brand messages are taking root, and which competitors are gaining mindshare. Oh, and there is an off-beat discussion on cosmetics for video game character design. Go figure. How do Brands stack up? 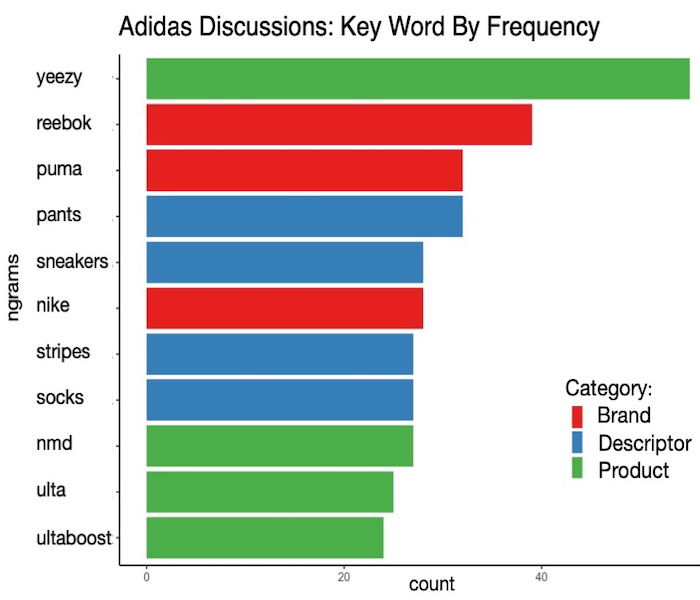 Mention charts add color to the discourse maps by showing how often brands are mentioned. You can track changes over time with discourse data’s subscription products and longitudinal tracking. Do Politics Predict Topical Engagement? 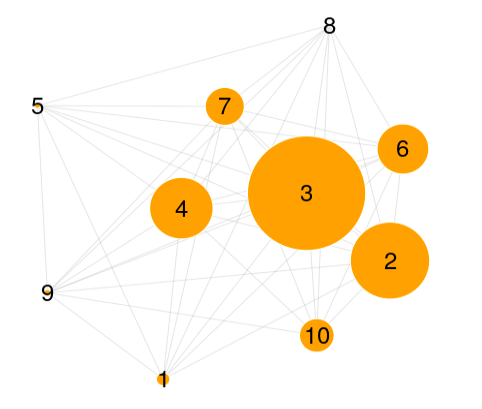 Looking at active authors as opposed to subscribers across a number of Reddit discussion groups (subreddits) can reveal where people spend their time and energy. In these Affinity Plots, the authors are mapped against three topics. The proximity reflects affinity, or mention of a topic, while the distance from a pole reflects lack of mentions or engagement on that topic. 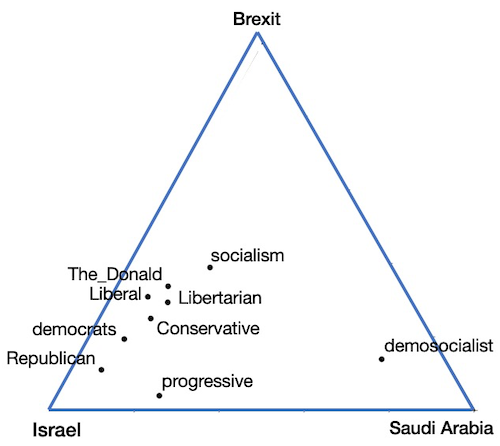 In this example, note how all but authors in the Demosocialist subreddit stay away from Saudi Arabia and are only slightly more engaged with Brexit. Israel is the hot discussion topic. Does Political Standing Coorelate To Brand Interest? In this example, perhaps for some on the Left. The authors in progressive and demosocialist subreddits engage largely with Disney. 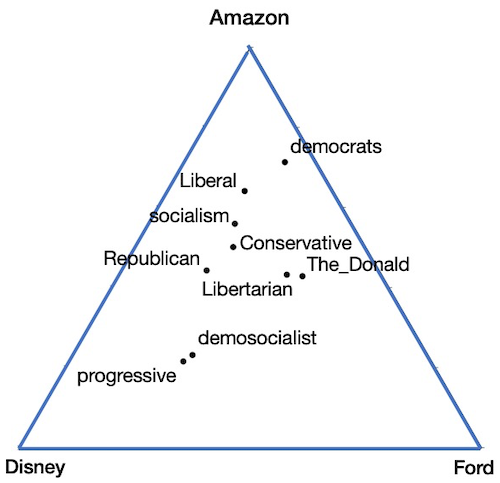 Libertarian, Republican and The_Donald authors reside in the center, showing no predominate engagement with either of these three brands, although no one shows a strong need to write about Ford. Liberals and Democrats lean towards engaging in discussions with Amazon. Asking Advice Appears Only Slightly Affected By Political Leaning. 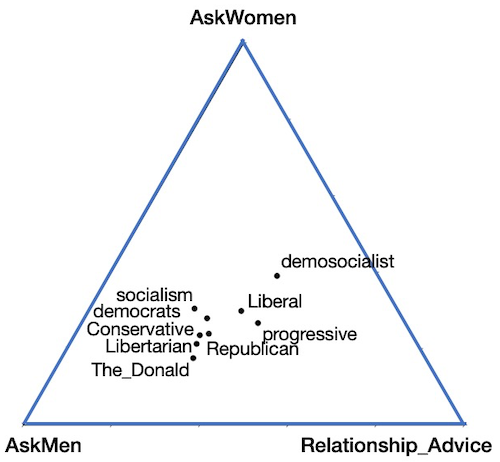 Perhaps authors in Libertarian and Republican subreddits feel more at ease engaging with men, while Liberal and demosocialist subreddit authors appear fairly neutral. No one seems to lean decidedly towards engaging with AskWomen on Reddit as opposed to writing in AskM or Relationship_Advice. Discover the voices of your most important audiences. See beyond clicks and likes to the larger online conversations that exist around us. Understand how perceptions are formed, how trends and ideas take shape. Track who's influencing the crowd, and with what ideas. Capture the big picture that relates to your industry, your products or your audience. Have ideas for topics important to you. Let us know - we'll map the conversation. Nike signs Kaepernick - Adidas stakes out an alternative high-ground. What Fuels Brand Loyalty? Politics, Ethics, or Product? In September of 2018, Nike launched their Kaepernick ad campaign. A political debate exploded, but the increase in stock price and sales was estimated to increase Nike's value by about $6B. Kaepernick proved to be a merchandising machine. 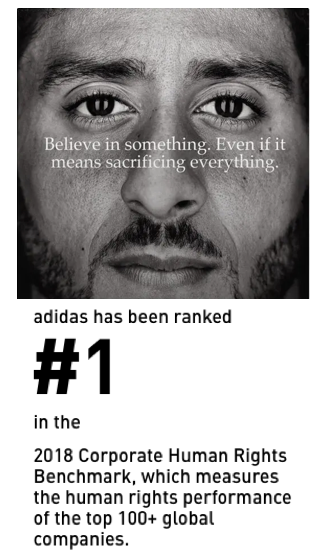 In November of 2018, Adidas posted that they were "#1 in the Corporate Human Rights Benchmark". Every sportwear and fashion consumer tacitly understands that their purchases were likely produced in Asian factories - perhaps sweatshops. We looked at a sample of millions of Reddit discussions for October, 2018. In Nike's case, a persistent conversation pitted the politics of supporting Kaepernick against Nike's perceived continued use of manufacturing sweatshops. A sampling of Reddit authors: "Your opinion may differ, but I personally don't think Nike supporting the 1st Ammendment outweighs their slave labor and sweatshop practices..."
"I respect Nike for the bold move, but I also remember they’re a big corporation that has a sweatshop problem." "...I feel like a lot of Nike/Adidas designs have the logo simply stamped on. With Adidas it more has to do with the way the striped are integrated (looks natural on UB, looks stamped on for Pureboost)." Used by corporate strategists, branding experts, innovation teams, policy researchers, political leaders.